The Input and Output Saturation circuits are voiced differently from each other. The input side saturation works with the input gain control to give a very soft clipping. Lots of 2nd order harmonics to warm your signal here. Input saturation will be present on the Dry side of the Mix control as well as be passed through to the follower and the compression core. Output saturation is active on the Compressor’s VCA circuit. It can clip much harder than the input side. Output saturation is great for distorting the initial transient from a slower attack, giving the initial hit more harmonics and a punchy timbre. Input Gain – Sets the input level on the Signal In jack. Range is +-12dB. 12 o’clock is unity gain. This level is normaled to the Side Chain input. Input level is indicated on the red In LED. Input Saturation – This knob and control switch determine the amount of input side saturation. The circuit is a soft clipper that begins to clip at +-4 volt peaks. Switch must be up for knob to be enabled. Threshold – This sets the input level where compression starts to happen. 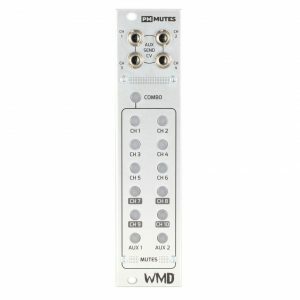 Its range from -14dB to +24dB covers the modular range. There is a CV input for this control that is added to the knob value. Th+ and Th- LEDs indicate whether the input signal is above or below the compression threshold. Knee Switch – This switch determines the threshold break point behavior. Hard knee will start compression at the specified ratio immediately at the break point. Soft knee starts compression slowly over the range of 3dB before the break point. Ratio – Controls the amount of compression as a function of input level to output level. So, for every dB in level increase past the threshold, you get X level increase in the output. 4:1 ratio means 4dB input to get a 1dB change in output. ∞:1 is a limiter where the input signal is limited to the threshold level. Detector Mode Switch – This three position switch selects between RMS, Adaptive and Peak level detection modes. RMS – Ignores fast transients, slower and smoother. Good for un-compressed attack transients. More vintage sounding compression. Adaptive – Smooth like RMS, but detects fast transients. Good for many types of material. Modern sounding compression. Peak – Very fast, follows the signal closely. Use with manual A/R with slower release for good peak limiting. A/R Switch – This switch determines whether the manual Attack and Release knobs are activated, or if the Level Detector automatically controls attack and release times. Switch must be in Manual mode for Attack and Release knobs and CV to be enabled. 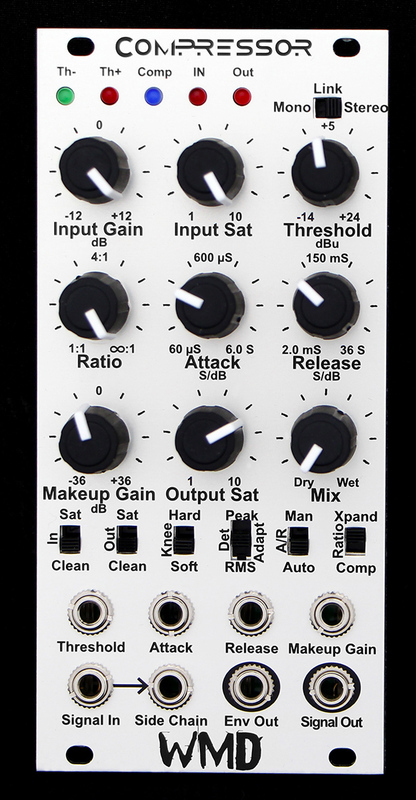 Attack – This knob sets the amount of time taken for the onset of compression. Rotate clockwise for a slower attack. Attack may be affected by the CV input. Attack is measured in Seconds / dB. Release – Controls the amount of time to open the compressor after the input signal goes back below the current level of compression. Rotate clockwise for longer release. Release may be affected by the CV input. Release is measured in Seconds / dB. Ratio Mode – This switch controls whether the compressor reduces output level as the threshold is crossed (Comp), or increases level by the Ratio as the threshold is crossed (Xpand). Beware that flipping to Xpand will greatly increase the volume at the output. Reduce Makeup Gain before engaging this switch. Comp LED – This blue LED shows the compression level to give rough feedback as to how much compression is taking place. 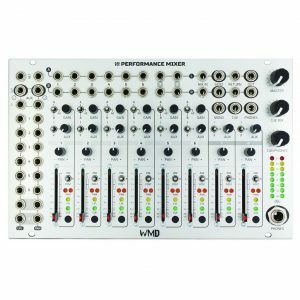 Makeup Gain – This controls the amount of gain at the output stage. Range is -36dB to +36dB. Use higher settings to bring the level back up after high compression. If using Xpand mode, set this lower than 0dB to avoid high output levels. There is a CV input to further control the amount of Makeup Gain. Output Saturation – This switch must be enabled for the knob to have an effect. Moderately Hard LED saturation begins at +-6 volt peaks. Mix – This knob mixes the dry input signal with the wet output signal, allowing for simple parallel compression. Also use it as a way to compare input to output easily. This is the final output to the Signal Output jack. Its level is indicated on the red Out LED. Side Chain – This input drives the level detector of the compressor. When nothing is plugged in, the Input signal is normaled through to the detector. This allows you to use the compressor as a ducker or expander with other signals. 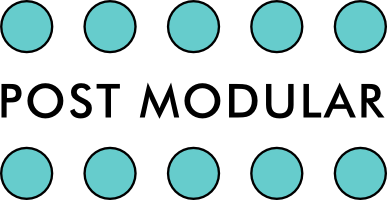 Envelope Out – This output jack produces the Compressor’s control signal for use in other places in your modular. 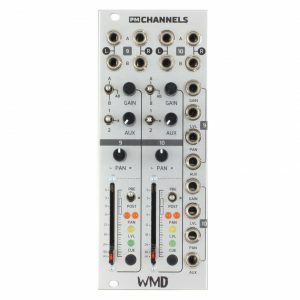 Link – If you have two WMD compressors, you can link them together with an 1/8” cable on the back. Flipping each Compressor’s Link switch to Stereo will connect the two detectors together for true stereo bus compression. Knobs must be set the same for both channels to truly behave the same, as only the detector information is shared.